Every county in Kansas is officially drought free for the first time since April of 2011. Gov. Brownback made the declaration in an executive order this morning. It corresponds with findings by the U.S. Drought Monitor, which recorded Kansas as drought free two weeks ago. 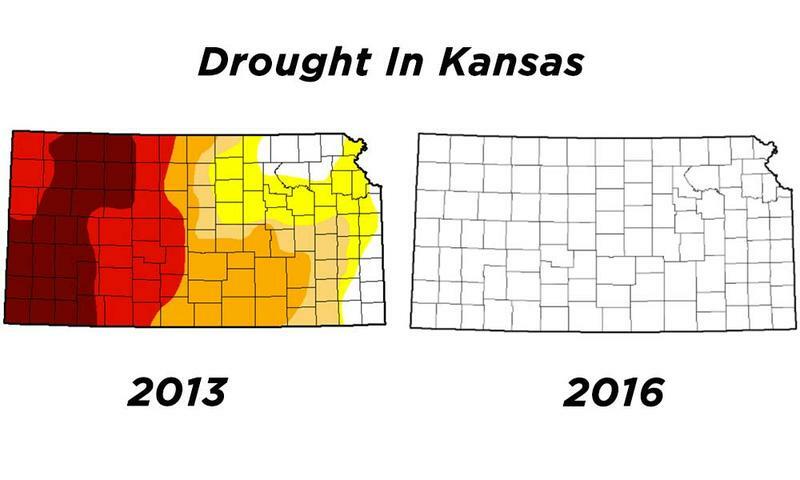 A drought map of Kansas in 2013. 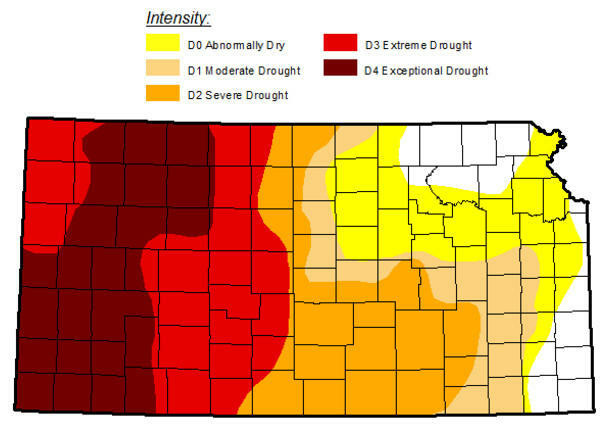 If you were to look at a drought map of Kansas from June of 2013, you’d see huge areas of orange and maroon, which meant most of central and western Kansas was under severe to exceptional drought. Those dry conditions lingered for a couple more years until this past May, when strong storms finally pushed the last few counties in western Kansas out of the drought. Max Tjaden owns a farm in Clearwater, KS. He says he’s had some tough seasons over the last six years, but federal crop insurance has been a lifesaver. He describes it as a tight-wire act; in the year’s you fall off, the insurance is there to catch you, and you get back on the following season. Tjaden says he’s almost ready to harvest this year’s winter wheat crop, which he says looks healthy and mature. The USDA is forecasting an 8 percent increase this year for Kansas’ winter wheat harvest. 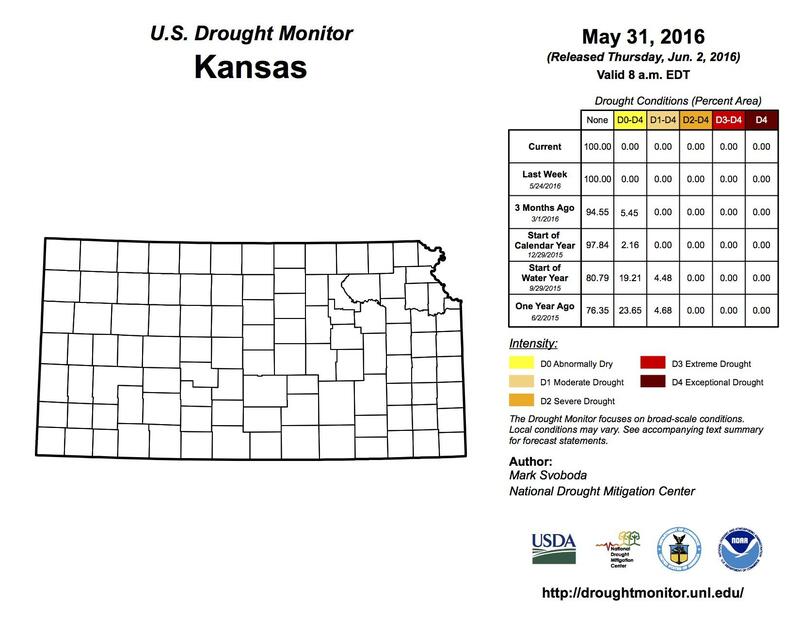 The month of March was short on moisture, and now drought is creeping across much of Kansas. Assistant State Climatologist Mary Knapp says March is normally a wet month, so last month's dry conditions had a big impact. The Federal Reserve says farm income growth slowed across the Plains and western states in the first quarter, as costs increased and the drought lingered. Bankers expect farm income to weaken further in the region during the second quarter. But land values continued to increase in the first quarter on top of several years of significant growth. Cropland values rose 20 percent over 2012, and ranchland values grew 14 percent. The 10th Federal Reserve District covers Kansas, Nebraska, Oklahoma, Wyoming, Colorado, northern New Mexico and western Missouri.